Pumping 10-to-12 foot waves were on offer at the primary venue of Cloudbreak today as the world’s best surfers whittled the competitive field down to the final eight at the Fiji Pro. Stop No. 5 of 11 on the 2015 Samsung Galaxy WSL Championship Tour (CT), the Fiji Pro saw a major ratings shakeup yesterday when wildcard Dane Reynolds (USA) eliminated Jeep Ratings frontrunner Adriano de Souza (BRA) in Round 3 of competition. The upsets continued today with Kai Otton (AUS) ousting No. 2 Filipe Toledo (BRA) during this morning’s Round 3 bout. 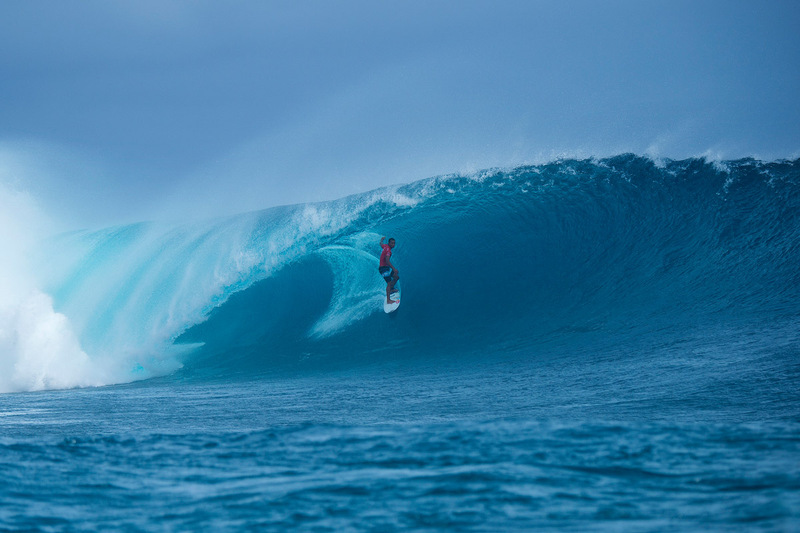 As the surf built throughout the day, so did the performances of the world’s best surfers. Julian Wilson (AUS), current WSL No. 8, put in a blistering Round 4 performance day, threading monstrous tubes on his backhand in securing a near-perfect heat total of a 19.43 out of a possible 20 and advancing directly into the Quarterfinals over Kelly Slater (USA) and Taj Burrow (AUS). Wiggolly Dantas (BRA), 2015 WSL rookie, navigated a tricky heat over rookie compatriot Italo Ferreira (BRA) and lethal wildcard Dane Reynolds (USA) to secure his spot in the Quarterfinals. With the swell building to at-times wild levels, Dantas found waves that offered scoring opportunity amidst the chaos. Joel Parkinson (AUS), 2012 WSL Champion, has had an uncharacteristic start to his 2015 season, coming into the Fiji Pro rated 20th on the WSL Jeep Leaderboard. However, the Gold Coaster’s undeniable talent and power, as well as his wealth of experience in the South Pacific, have reignited Parkinson’s campaign. Taking on compatriots in three-time WSL Champion Mick Fanning (AUS) and Owen Wright (AUS) in Round 4, Parkinson threaded solid barrels on his backhand and tore into unmatched carves to the tune of an 18.43 out of a possible 20, including the event’s first Perfect 10, and advancement directly into the Quarterfinals. Jeremy Flores (FRA), the lone European on tour, put on an incredible performance to cap off Round 4, showcasing impressive commitment both within the barrel and throughout his turns to post an 18.70 out of a possible 20 and advance through to the Quarterfinals. 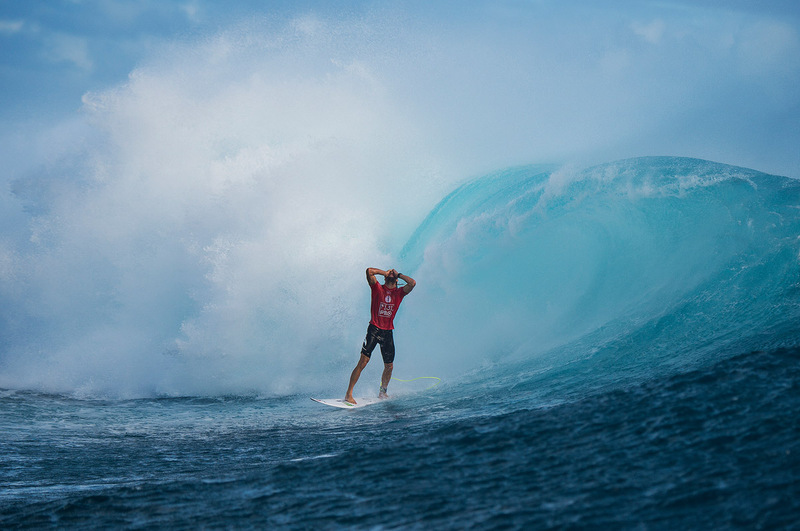 The afternoon’s Round 5 action was punctuated with high drama in Brazilian rookie Italo Ferreira’s elimination of 11-time WSL Champion and four-time Fiji Pro winner Kelly Slater (USA) in the opening heat of the round. Ferreira, who eliminated Slater from the opening event of the year on the Gold Coast, was an underdog in the face of the Floridian’s supernatural rapport with Cloudbreak and decades of experience. However, in an affair that was light on opportunity, the Brazilian combined poised tube-riding with powerful carves to oust Slater from the event. “I can’t believe it,” Ferreira said. “Pretty hard with the waves out there. So happy to make another heat. I can’t believe that I beat Kelly at Fiji. He’s the best. I’m just really happy to make another heat. Other Round 5 victors included Taj Burrow (AUS) over Dane Reynolds (USA), Kai Otton (AUS) over Mick Fanning (AUS) and Owen Wright (AUS) posting a Perfect 20 out of 20 en route to defeating Adam Melling (AUS). Wright’s commitment to placing himself as deep and critically as possible in the barrel was phenomenal this afternoon, netting the Australian only the seventh Perfect Heat Total in the sport’s history. Event organizers will reconvene tomorrow morning at 7:30am to reassess conditions. When competition recommences, up first will be Julian Wilson (AUS) up against Italo Ferreira (BRA) in the opening Quarterfinal heat. The new SSW swell peaks this afternoon, before starting to ease on Tuesday (still solid). Expect the fading trend to continue through mid week, becoming small by Friday. Although becoming rather breezy each day, wind conditions continue to look favorable for at least the mornings through the next few days (SE’erly Trades).